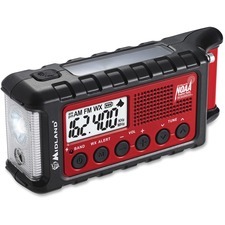 This versatile emergency radio keeps you informed during severe weather or civil emergencies, and can alert search and rescue teams to your whereabouts. Multiple power sources from solar, hand crank and a rechargeable battery ensure long-lasting functionality through any situation. Extremely bright flashlight with a low and high brightness setting uses Cree LED bulbs to effectively enhance your visibility in dark conditions. SOS flashlight beacon transmits Morse code for emergency assistance. Handy smartphone/tablet charger connects to your devices through a USB connection for quick charges. Ultrasonic dog whistle helps assist search and rescue teams in locating individuals during an emergency situation. NOAA weather radio notifies you when an alert has been issued on your local channel. 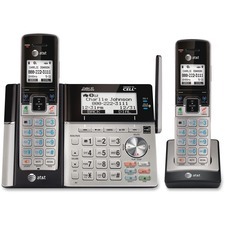 Two-handset answering system features Connect to Cell technology to make and receive calls from your cellular plan while enjoying the comforts of a home phone system. Pair up to two cellular lines and one landline with your cordless system. Then, enjoy the freedom to make and receive calls on all three lines at once. Mobile notifications let you know when your Android mobile phone (sold separately) receives a text, e-mail, social media update or calendar reminder. Downloadable phonebook directory stores up to 6,000 cellular phonebook entries to the cordless handsets. Caller ID Announce audibly reveals the name of your caller so you don't have to scramble for the handset to see your caller. DECT 6.0 digital technology delivers excellent sound quality and range while ensuring wireless networks and other electronic devices don't interfere with conversations. 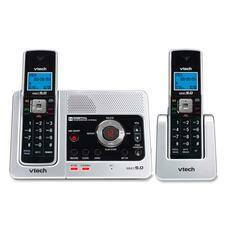 Answering system also includes HD audio with equalizer, push-to-talk, quiet mode and more. Dect 6.0 GHz Digital Cordless Telephone offers a Call Waiting/Caller ID that stores 50 calls, and special feature that allows you to easily change handset back graphic using one of five included inserts. Customize your own graphics with a free online tool. Your calls are digitized and encrypted, making it nearly impossible for anyone to eavesdrop. Telephone will not interfere with wireless networks or electronic devices. Telephone features page/handset locator, any key answer, last number redial, 50 name/number phonebook, handset volume control, English/Spanish/French prompts, selectable ring tones and voicemail waiting indicator. Energy Star qualified. 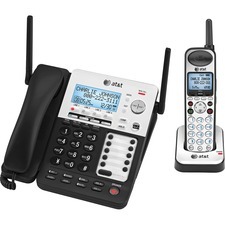 Corded/cordless answering system features Caller ID/Call Waiting, long-range coverage and clarity with a unique antenna design, and advances in noise-filtering technology. Caller ID Announce makes screening calls that much easier. The handset and base audibly announce the name of the incoming caller so no need to find the handset to see who is calling. Push-to-Talk feature lets you use the phone system as a multiple-handset walkie-talkie system to instantly communicate through the intercom between the handset and base unit. Compatible with cordless headset, phone system includes a base with corded handset and charger with cordless handset on cradle. Expand up to 12 handsets. 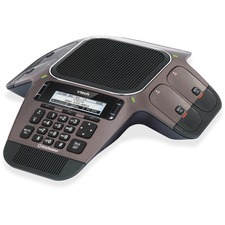 Corded/cordless answering system also offers DECT 6.0 technology, HD audio, conference up to four handsets, backlit keypad and display, voice mail, message waiting indicator, 50-name/number phonebook, English/Spanish/French setup menu, 14 minutes of digital recording time, flash, mute, and last 10-number redial. 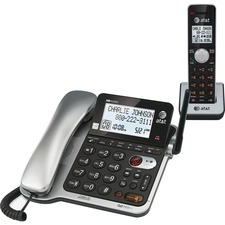 Speakerphone offers Caller ID/Call Waiting capability and a dial-in base speakerphone. Ideal for a small office or home office stand-alone phone. Phone features a 14-number memory, three one-touch memory buttons, flash, hold, and last number redial. Caller ID has a 65 name/number caller ID history, display dial and remove button. Setup menu is in English, Spanish and French. Speakerphone uses four AA alkaline batteries (sold separately) for the speakerphone, hold, mute, flash, caller ID features, screen display, feature options menu, directory, clock, and the CALL INFO light. Part of the SynJ cordless business phone system, this corded/cordless, four-line phone system offers unsurpassed range that redefines long-range coverage and clarity. Extendable range allows up to 980' per repeater and up to two repeaters linked for 2940' of range. Expand the phone system up to 10 handsets. Push-to-Talk Intercom delivers instant and easy communication between handsets and between base and handset. Page, intercom and call transfer between stations. Digital answering includes an auto attendant on each line, individual voice-mail boxes, 180-minute digital recorder and remote access. Phone system also offers Caller ID/Call Waiting, DECT 6.0 Zero Blind Slot technology, three-party conferencing, music on hold, 2.5mm headset jack, handset, speakerphone, headset, hold and mute functions, selectable ringer melodies, last 10-number redial and 50-name/number Caller ID history. 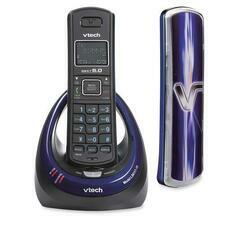 System includes corded base, one cordless handset, charger, two AC adapters, battery pack and belt clip. DECT 6.0 technology two handset cordless phone system with digital answering device and caller ID. Slim cutting-edge design. Conference phone with four wireless microphones features Orbitlink wireless technology to make your conference calls flexible and engaging. Integrated digital mixing technology delivers unified audio to give callers on the other end a seamless experience and the impression that everyone's speaking into the same microphone. Each wireless microphone provides up to 12 hours of talk time to keep your meetings going with just a single charge. And with up to 70 hours of standby time for each microphone, there's no need to worry about losing a charge mid-meeting. Magnetic charging bays in the base keep the microphones together and ready for your next call. Central, full-duplex speakerphone in the base allows callers to speak and be heard at the same time, just as they would in a face-to-face meeting. 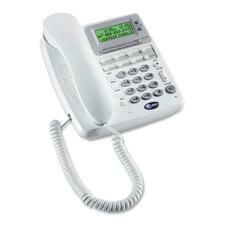 Conference phone also features a backlit display, multiple ringtones, mute indicator, dynamic noise reduction and more.